Thomas Charles Stratton is a painter of American realism whose art conveys the simple beauty found in everyday subjects. His emotive works depict serene landscapes, everyday occurrences and common humanity, deliberately avoiding the artifacts of modern life. While he is primarily a watercolorist his work in other mediums is abundant. Most of his subject matter is influenced by the natural beauty of his surroundings in the Hudson River Valley of upstate New York. In addition, his work has been inspired by his extensive travel and work experience on the New England coast and north into eastern Canada. 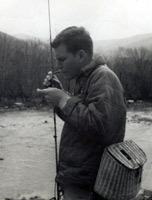 He has been fishing, hiking and painting the Catskill Mountains since 1963 and was a volunteer stream tester under the guidance of Art Flick, a giant of stream conservation and author of several books on fly tying and insect hatches. Flicks work was deeply instrumental in saving the Schoharie watershed. As a practiced fly tier Tom also purchased (fly fishing) necks from Harry and Elsie Darbie, famous fly tiers and friends of Tom’s. The Darbies played an important role in saving the Beaverkill watershed. Stratton’s paintings have found ready acceptance among art lovers and his work can be found in many collections all over the world.